Acupuncture is a time-tested form of healthcare that involves inserting fine needles into specific points on the body. It is based on a medical theory that defines good health as a balance of systems and circulation in the individual. Acupuncture can reestablish balance by improving the flow of energy and blood, by enhancing circulation to systems that are depleted or by directing it away from areas of excess. There are hundreds of acupuncture points on the body, and each point has several potential functions. I will choose appropriate points based on an in-depth diagnostic process which includes a thorough health history, pulse diagnosis and tongue diagnosis. I also take in many subtle details about you, like the sound of your voice and the luster of your skin, in order to arrive at a working diagnosis. Points are chosen according to the function they provide in treatment; they may or may not be chosen in the area of the condition being treated. Contrary to a common misperception, acupuncture is rarely painful. Acupuncture needles are not much larger than the diameter of a human hair, and they are not hollow like a hypodermic needle. They glide between tissues with little or no discomfort. In fact, many clients fall asleep during treatment. For optimal safety, I use pre-sterilized needles that are disposed of after each use. I will work closely with you to ensure that acupuncture is supported by education towards healthy habits, like proper nutrition. I will spend time learning about you and your health, so that a plan can be created to achieve your goals. It is widely believed that the practice of Chinese herbalism is the oldest form of medicine in the world. It is based on the same medical theory as acupuncture — the in-depth diagnostic process that brings the practitioner to a very specific understanding of a patient. Once a diagnosis is reached, I create a formula, typically choosing a combination of herbs, much like I choose acupuncture points. Herbal medicine may be used alone, or as an adjunct to acupuncture treatment. I am nationally certified in Chinese herbal medicine and maintain an extensive dispensary onsite at the clinic. It contains substances of plant, mineral and animal origin. Some of the herbs are common plants familiar to most people, like ginger, peppermint, ginseng and sesame seed; others are less well known, like schisandra, ophiopogon or leonuris. I do not use any endangered species, and my supplier carefully monitors the herbs for safety and authenticity. I often treat lung and sinus problems. In most cases I find it important to include herbs in the treatment. My patients find relief in symptoms and often can reduce or eliminate medications, or avoid the use of antibiotics. The discomfort of musculo-skeletal pain or headache is the most common reason people seek out Chinese medicine. Pain of any kind, chronic or acute, often is alleviated by treatment. With its balancing properties, Chinese medicine is helpful for many emotional issues. It can be used in conjunction with western medications. Sometimes Chinese medicine brings about a big change in gastro-intestinal function. I see a lot of success in treating IBS and other bowel dysfunction. I’ve had many patients find they no longer need anti-acid medications for acid reflux. Appetite issues, nausea and vomiting and GI pain also may be treated successfully. Sleep problems can arise from a variety of imbalances. Getting to the root of the problem is one of Chinese medicine’s strengths. I have experience working with kidney and bladder issues including urinary dysfunction, pain and inflammation. Early treatment of UTI can prevent the need for antibiotics. Chinese medicine can offer assistance in degenerative conditions by relieving pain and by supporting a person’s energy. Heart issues should always be investigated by a medical doctor. I play an adjunct role in treating arrhythmias, angina or debility from cardiac procedures. I often treat hypertension. I’ve been working with children for many years and treat a very wide range of conditions. I use other modalities besides needles when necessary. See the pediatrics page for more. People of all ages can benefit by including Chinese medicine in their health care. The approach to treating children is somewhat different than that of adults. With acupuncture, very few needles are used, and in young children the needles are not retained, but quickly inserted and withdrawn. Oftentimes the child is unaware of the procedure. I rarely use needles on children younger than 1 year; babies respond very well to Tuina, a form of massage that can set their systems right. The pediatric concerns I see most often in my practice are asthma, cough, sleep issues and GI problems. Older children have these same complaints, along with issues that, sadly, are often stress related. The calming effect of acupuncture can be very helpful in addressing symptoms caused by the demands of modern life. I was drawn to the study of Chinese Medicine largely because it is a nature based medicine, including people as an integral part of our natural world. My initial infatuation with the beauty and poetry of the medicine quickly grew into a deep respect for its effectiveness in relieving so many health concerns. After 20 years in practice, that respect and fascination grows ever stronger. I practice in an environment that is comfortable and quiet and begin a first appointment by spending time learning about a person’s health and their goals in coming to see me. I believe self-care is our most essential care, so I pass along whatever information will help them stay in as vibrant a state of health as possible. I maintain an open mind toward other forms of medicine, am happy to work with other practitioners and have the benefit of a great referral network in the area. If your are contacting Sue to make request an appointment or schedule a call back, please do not include any personal health information in your correspondence. 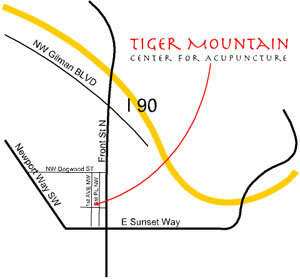 The Tiger Mountain Center for Acupuncture is a building located at 120 1st AVE NW, Issaquah, Washington, owned by 155 FIRST PLACE NW, LLC. The Center houses a variety of independently owned and operated businesses, which offer acupuncture and/or acupuncture related services. Neither the owner of The Center nor any of the other businesses oversee the business affairs of any other tenant and cannot be responsible for the services that other tenants offer. If you have any question or concern about the services being offered by a particular business at The Center, please inquire with that business directly, with any licensing authority that regulates such businesses or with your own advisors.